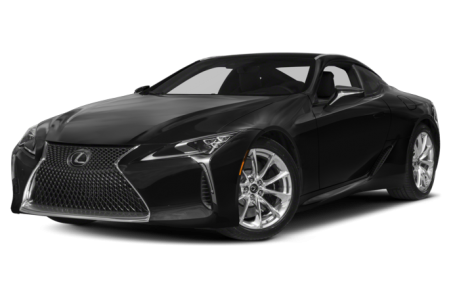 The Lexus LC 500 luxury sport coupe is based on the Lexus LF-LC concept, which we first saw four years ago, and Lexus is not shy about calling the new two-door one of its "flagship products." The LC 500 is a mix of curves and sharp angles. The coupe's windows slope down toward the front, and that, along with a number of other body lines make the LC 500 look as if it's leaning forward with an aggressive stance. There are a number of thin, functional ducts and openings across the body and it wears many of Lexus' traditional styling cues, particularly the headlights and grille. The LC 500 features a new 3-D mesh design in its spindle grille, as well as LED headlights with very thin projectors that allowed designers to pull the hood lower. Available are a flowing carbon fiber roof (glass is standard) and an active rear spoiler. Wheels come in two sizes: 20 inches or 21 inches, both made of forged aluminum. As wild and angular as the outside is, the inside is relatively subtle, with a fairly straightforward design and a driver-oriented cockpit. Lexus says the cockpit was designed so that the driver's hip point would be as close as possible to the car's center of gravity. The LC 500 features premium materials throughout the cabin, including magnesium alloy paddle shifters and available Alcantara and supple leather on the seats. Making its debut on the LC 500 is a new Lexus Multimedia Package that features an updated graphic interface. A new Pioneer audio system that was specifically engineered for the LC 500 is standard; a Mark Levinson system is optional. The LC 500 is the first vehicle to use Lexus' new rear-wheel-drive platform and it packs plenty of punch under the hood, borrowing the same 5.0-liter V-8 found in the RC F and GS F. It makes 471 horsepower and 398 pounds-feet of torque. It is mated to a 10-speed automatic transmission that Lexus says is the first of its kind in a luxury vehicle. The transmission takes into account acceleration, braking and lateral g-force when selecting the right gear, no easy task when there are 10 of them. There's also an active acoustics feature that works with the exhaust system; above 3,500 rpm baffles open to give the LC 500 a distinctive exhaust note that Lexus describes as a "raucous melody." Safety features include an all-speed radar cruise control that works even in stop-and-go traffic, a collision prevention and mitigation system, lane keeping assist and automatic high beams.